In the year 1873 an organ chamber and an organ, the gift of Mr Crawshay, were added. To mark the re-opening of the altered church, a special service was held on the 7th April 1873, when the choir was led for the first time by the unaccustomed strains of the organ. 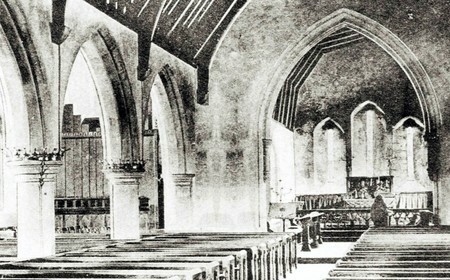 It is probable also that the choir sat for the first time in the stalls in the chancel at this service, and not the western gallery where, it's thought, they had had sat since the rood loft was demolished in the alterations of 1860. The sermon was preaced by the Bishop of St. David's Connop Thirlwall, who took his text from Psalm 150 "Praise ye the Lord ... praise him with stringed instruments and organs ... let everything that hath breath praise the Lord." We do not know whether the 'stringed instrument' of the clerk was played on that occasion, but we like to think so. This is a photo of All Saints dated around 1900 - the wooden organ pipes installed by Robert Postill of York, are clearly seen on the left. Gas light was installed in the church 1872-3 about the same time as the organ and created conditions in which evensong became a permanent custom in church worship. The present organ, built by Peter Conacher, replaced the old one in 1916, but some parts of the old organ were incorporated in the new.